Surprise Rain – If I didn’t know better, I’d say I have some power over the weather…I have a somewhat superstitious approach to summer rain, in that I believe if I say it’s not going to rain, maybe it will rain… case in point, last Friday’s weather. We probably received a quarter inch of rain over the course of the entire day, much of it falling as a fine drizzle. Although not enough to really saturate the soil down to our crops’ root zone, it did add a little moisture to the top couple inches, provided a nice break from the heat, and temporarily tamed the dust situation on our driveway. Now we are back to the familiar constant sun, and are anticipating a mini-growth spurt in our crops in response to the rain. Rain + Sun = Happy plants. August Rhythm – We are settling in to the familiar routine of mid-summer. We are harvesting produce every day of the week now, either for markets, restaurants, the CSA box, or just maintenance picking of the crops that won’t stop: cucumbers, zucchini, and, soon enough, green beans. Our crew begins the day at seven, meeting in our wash and pack shed to look over the pick list for the day, make a game plan (pick the delicate leafy things first, before it gets hot; get the whole crew on the cucumber and zucchini harvest so it doesn’t take forever), and then load our harvest totes into the vans to head to the field. Today is restaurant harvest day, which is a complicated harvest. Jason has received orders from about 20 restaurants after sending out our “fresh sheet” on Sunday night. He’s collated all the orders into one spreadsheet, which totals up how many of each item needs to be picked. After the first round of leafy greens comes into the packing shed, one or two people stay in to start organizing and filling orders. By mid-afternoon, usually, the harvest is wrapping up and the orders are all tidily stacked in the walk-in cooler, awaiting their Wednesday delivery. Wednesday morning starts it all over again when we get up and start harvesting for our two Thursday farmers markets. It will go on like this for the next 6-8 weeks. 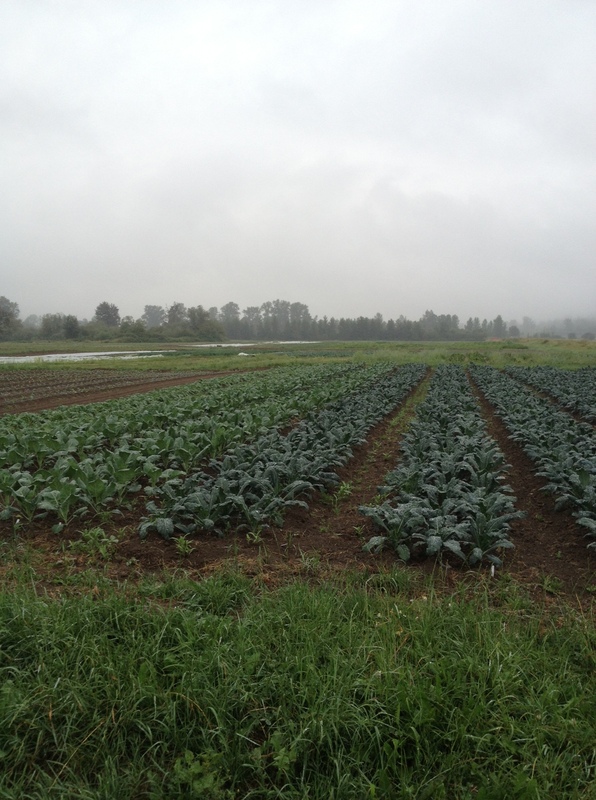 In between our regularly scheduled harvests, we also will pull all our shallots and storage onions, dig and store a half-acre of potatoes, and begin to harvest winter squash. We also continue to water, weed, and generally encourage plants to grow, but this is truly the time of harvest bounty. Tomatoes – We were happy to find enough ripe tomatoes this weekend to put a token quantity in the boxes today. Everyone is getting either one medium size or two small tomatoes. The varieties are ‘Pink Beauty’, our standard medium size slicing tomato, and a smattering of Black Prince, varieties with a hearty enough skin to hold up to the CSA packing process and transport. We pick the tomatoes for the CSA a couple days early, and they should arrive either ready to eat or just a day or two away from perfectly ripe. Leave your tomatoes out on a countertop – not in the refrigerator. This way they will continue their natural ripening and taste the best. Eat them when they are fairly soft, but before they get squishy! Purple Majesty Potatoes – We’ve added a few new members to the CSA this week, so I’ll reiterate the explanation of our dirty potatoes. These potatoes are still in the stage we consider “new” potatoes, which means they still have green foliage, and their skins have not had time to harden up and cure. We deliver them to you unwashed, because our mechanical root washer does too much damage to their skins. Leave them in their paper bag, ideally in a cool, dark place, until you are ready to cook them. Wash gently just before preparing. This variety is a big favorite of ours. It’s amazingly dark purple in color, and is wonderful baked, roasted, or fried. It develops a nice crisp browning on the cut surfaces. Chioggia Beets – This Italian heirloom variety is the beet-lover’s beet. Its flavor is intensely sweet and earthy – normally I prefer the taste of roasted beets over boiled, but the advantage to boiling with a beet like this one is that it will reduce the earthiness… if that’s what you prefer. – Slice a raw, medium size Chioggia beet as thinly as possible (use a mandolin if you have one). – Arrange the slices on a plate in a single layer, and sprinkle with red-wine vinegar (sherry vinegar is good too), and a pinch of salt. – Allow the beets to rest in the vinegar for up to half an hour. – Meanwhile, mince up a bit of sweet onion and parsley, and make a little pile on the center of the plate. A spoonful of capers is nice too. – Eat the sliced beets together with a little bit of the toppings. Lettuce – One thing that isn’t at its best in persistent warm weather is lettuce, but here is a cute little romaine that will be nice in a tomato sandwich!